NUnit and xUnit.net have more regular releases than mstest. This is understandable since they are both small, opensource projects whereas mstest is part of Visual Studio which is far from a small project and far far from an opensource one. As a result, they have more mature feature sets. As a long time mstest user, I was happy to see Visual Studio 2010 is still improving mstest. 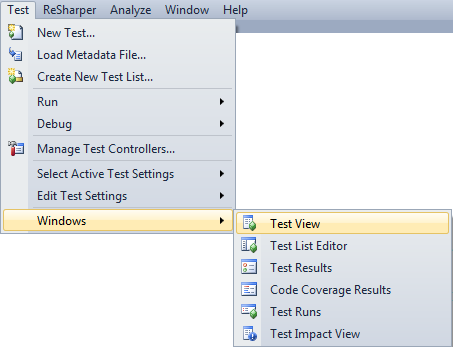 Recently mstest introduced a useful new feature Test Categories! Often I find the need to group related tests. Maybe I want to group and run a subset of tests within a test Project. Visual Studio already supports grouping by namespace and project. When you have a cross-cutting concern such as Logging or Localization, which covers many namespaces and projects this breaks down. Enter TestCategoryAttribute. TestCategoryAttribute lets you decorate your TestMethod’s with any category name and easily search and run only those tests! Select the Test View, then Test Categories and enter the category name! In the sample I created a ‘Method’ category to separate my method tests from property tests… it’s not a great example of when to use Categories, but it demonstrates how they work. This entry was posted in C#, Unit Testing and tagged mstest, TestCategoryAttribute. Bookmark the permalink.